It would be easier to pull the covers back over her head. It would be simpler to let the sun stream through the windows and not rise to greet it. It would be less painful to turn over and let sleep seize her again. But she doesn’t let the depression win. Not today. She pushes back the blankets and puts her feet on the floor. She stretches her arms to the heavens and whispers, “Help me, Jesus.” She takes a step away from her comfort zone and into the arms of the Savior who is waiting to walk with her through every moment of her day. Depression is real. And I believe we are whole beings who need help with every aspect of it—physical, emotional, mental, and spiritual. So if you’re struggling with ongoing sadness, then learn the symptoms, go see your doctor, find a wise counselor, and do everything you can to help yourself get what you need. Also know this: God doesn’t condemn you for your feelings. Many of the well-known characters of the Bible struggled with periods of depression too. You’re not alone in your struggle, and it’s nothing to be ashamed of. I’ve personally wrestled on and off with depression—and most likely will for the rest of my life. I don’t understand why this is a “thorn in my flesh” (2 Cor. 12:7). But thankfully I’ve learned this truth along the way: God is on my side, especially in those times. I love that the verse above says that God encourages us. Have you ever thought about that? When the day seems difficult, when you’re weary, when you feel like a failure . 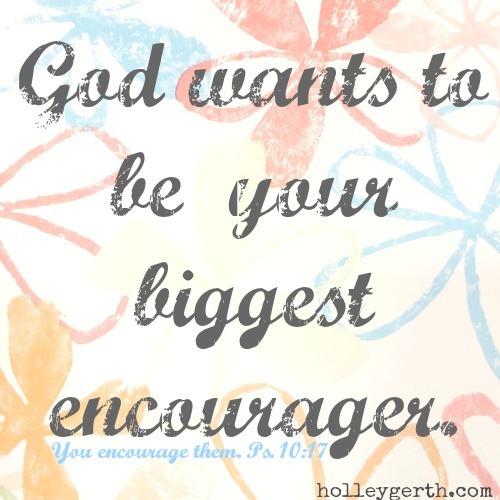 . . God is encouraging you. For so long I thought of him as standing by and shaking his head as he wondered, “Why can’t you get it together?” But that’s not his heart toward us at all. He looks at your life with infinite love and tenderness. And he knows how hard it is to be us sometimes. He lived in this world. He experienced pain. He died on a cross. Jesus understands how brutal this world can be. Depression is a hard enough battle on its own. God doesn’t want you to add guilt and shame to what you’re already trying to overcome. Instead he wants to encourage you. What if, on the days when it’s hard for you to get out of bed, you imagined him reaching out to lift you up instead of being disappointed in you? What if he’s cheering as you take your first step into a day that’s not one you want to face? What if instead of saying “get it together,” he’s whispering, “Let’s do this together”? And it can change us. You are encouraged, not condemned, my friend. The excerpt above is from my new devotional book, What Your Heart Needs for the Hard Days. We’re going through it together on Facebook and we’d love for you to join us. Come on over, friend. Thank you Holley. I just purchased and am reading your most recent book about hard days and also Bonnie Gray’s book on Whitespace. When I read about having friends who I can share my deepest feelings with and who also know Jesus I was amazed. My experience with church people is that if one has to take medicine or has issues that they had/have to see a counselor they are ALL WRONG. I only have one friend who I can share a few things with . Another friend recently said I was not spiritual enough for her and dumped me. I struggle with knowing Jesus loves me and I am acceptable to Him. I feel so alone. I do have PTSD as well as many medical conditions and just need someone accept me the way I am and love me. Thanks for yet one more reminder that Jesus loves me. I struggle to know that. Dear Rachel. My heart goes out to you. I understand what you are writing here. It is just so hard to understand and believe that people from your church judge you because of what clearly is a disease. I know how lonely you can feel, how deserted even though you know that our dear Jesus loves you through and through. I myself eventually decided to leave my church after receiving similar treatment. And you know, I discovered that “the church” , that is actually ús; you and me and Holley and other sisters in Christ who so love Him and cling ourselves to Him because we know how much He understands every tear, every outcry of being desperate and forlorn. And this church is the church I want to worship in, it is not a building, it is a worldwide group of people with the same wish: to honour and worship Our God. I hope that you wil be encouraged time and time again by other people. Holley encourages us tremendously and you know what is so great about “our church”? I live in the Nethetlands, far away in Europe, but our hands reach across the seas and oceans, by way of books and the internet. And we are blessed! Tomorrow we will both start a new day. I will try and bear in mind that we can both start it with this beautiful piece that Holley wrote. Blessings to you, hold on, take His hand, I wil try so too. From a sister in the Netherlands. You are not alone. I understand you so well. I have gone through churches of several titles and had the same problems. When they found out my troubles they started turning their backs. My last church I was at I served with deep love and was very active for over 12 years. They had about 250 members. I ran a program that had 57 members all working together to write place cards with happy stickers and a hand written message for the trays of 1625 people in 15 different nursing homes once every month. I also subbed for the secretary whenever she needed to go away or was sick. But when I started to have problems I was told if I really wanted to I could get better and instead of visits and support I received two letters telling me I was no longer spiritual enough and eventually I was kicked out. BUT – I am still running the Tray favor program three years later. Yet – cannot go to the church. So as you can see, I understand. I know exactly how you feel! I made a booboo in one sentence. I wrote – He alone will lift you up rather than judge for such things as illness. I meant He will lift you up rather than judge you! Please cross out from your thoughts that He would ever judge you for an illness. See – I am imperfect as anyone else. Again He ill lift you up and never judge you for an illness. Thank you for these, as always, encouraging thoughts. I love the idea of imagining Jesus reaching out to lift us up and cheer us on. 🙂 Hugs to you, Holley! Holly this really touched my soul today. I’ve been struggling now for about 3 years and there are those who think if I just tried and read my bible more I’d be okay. “NOT” I’ve prayed read my bible read many devotions. And I still have days where I can hardly function. I’ve learned not to listen to satan’s lies (and that’s what he does when we are down). He thinks he can talk us out of believing Gods words to us. Rachael I’ll pray for you and I would love for you to pray for me. Lift your face to the heaven and just say Jesus. And He knows what we need. I will pray for you, Linda. Thank you Annette for your kind comments. Let us all pray for each other. I know where you’re coming from Linda. Tonight I am thinking about going to work tomorrow and with my health problems it is hard enough but to feel alone makes it more difficult. Today I finally felt like I connected with Jesus. Thank you for your post today! It was sent just as I needed it!!! I ordered your book this morning. Thank you for helping!! Like you, I have suffered from depression “off and on” (more “on” than “off”) for more years than I care to think about. At this particular moment, I am in really depressed place because of several situations in my life. Thank you for your post because you’ve convinced me to go see my counselor. I would appreciate everyone’s prayers for God’s peace, God’s wisdom and God’s boldness so that I can face these situations. A beautiful encouragement today. Thanks you. Thank you for the way you always encourage my heart! This post is exactly what I needed today. I, too, struggle with chronic depression, and some days, it’s almost just too much. All I want to do is hide in my bed, and wish life was way more simple. Such a beautiful reminder of God’s never changing love for His children, no matter what their lives look like. Thank you, Holly. Oh Holley! Could more perfect words ever be found for me at this moment ?! You touched my heart with what I needed so badly to hear today. I have suffered with serious depression all my life. Chemical depression (brain chemicals), poisoning from working with chemicals, and emotional depression. I have suffered fatal illnesses and lived and still have many other illnesses. I suffered years of sexual abuse and all manor of troubles that the enemy could throw at me. In my forties I had three DOA suicide attempts. I was brought back on the way to the hospital each time. God really made it clear on the last one that He wanted me around. I took 1800 pills and was found 12 hours later and yet they were able to bring me back with no damage. They were caused by the unrelenting depression caused by the chemicals I was using at work. My depressions bounced around. I would breakdown and get help and within a year be fine only to have it happen ten years later. Over and over again. When I turned 70 it happened again but this time it stayed. Having no family doesn’t help. I have been in constant therapy for three going on four years now and my Therapist Angel is wonderful. Most of the emotional issues have been taken care of yet the depression and the newly added panic took over. Finally, I gave in and agreed to what seemed to be the ultimate defeat. I went to see a psychiatrist for medication. My Therapist Angel went with me because to me it was a failure of the greatest proportion. I started on meds two days ago and this devotional helped me see so much. I see now that taking the medicine is not a failure but a triumph. If your body is failing you and it needs the help of medicine – then where is the failure in that? Thank you for this post! I woke up this morning going through all my blessings – thanking God for my family and job, etc. I have to do this about every other day. I just get so overwhelmed! Totally amazing! Thank you again for always knowing we need to read! My daughter needs to read this! Thank you! “To encourage means ‘to give courage'”. Love that! Depression is so, so misunderstood in the faith community. Lots of misinformation and condemnation out there. Thank you for clearing the fog! Gosh, thanks for this, Holley. I wouldn’t say that I have Depression right now, but I sure do have Big Feelings and anger and bitterness about some difficult situations in our life right now. I think it is so easy for me to blame God for causing them and assume the worst about Him… but what a spin this puts on it all… truths I KNOW to be true… but clearly need to hear afresh. He is FOR us, He is cheering us on, He ENCOURAGES us. Thank you, my friend. Thanks. I needed that. Adding shame and guilt to our struggles just makes it 10 times harder. Mary, I’m a big supporter of working with your doctor and other professionals like counselors. I’d recommend you get in touch with someone right away and take the steps you need to so you feel better again.